Everybody wants to be a famous It Girl. Don't they? Anna Huntley's aims in life: to recreate famous film scenes with Dog (pet Labrador) such as the lift from The Lion King during that Circle of Life song; to not accidentally set Deputy Queen Bee, Josie Graham's, hair on fire. 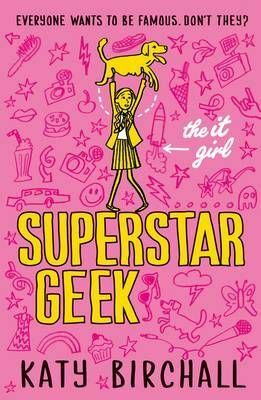 "Fans of Geek Girl will love this!" (Top of the Pops). This is a hilariously funny and deliciously romantic 'clean teen' book for teens. It is perfect for fans of Geek Girl and Girl Online. Everybody wants to be a famous It Girl. Don't they? Anna Huntley's aims in life: to recreate famous film scenes with Dog (pet Labrador) such as the lift from The Lion King during that Circle of Life song; to not accidentally set Dputy Queen Bee, Josie Graham's, hair on fire. Again; to keep first and only school friends by not doing anything in usual manner of socially inept dork and outcast; to work out whether 1) and 2) constitute being socially inept - or outcastish; and to hide in the cupboard. For life after her dad gets engaged to one of the most famous actresses ever, the paparazzi move in and everyone in school (The World) is on the brink of discovering why no one wants to be friends with Anna...This is fantastic, laugh-out-loud read for girls aged 11+ who love Louise Rennison and Zoella. Katy Birchall is the exciting debut author of The It Girl. She also works as the Deputy Features Editor at Country Life. Katy won the 2011 24/7 Theatre Festival Award for Most Promising New Writer.Her pet Labradors are the loves of her life and she is mildly obsessed with Marvel comics, Jane Austen and World War II spy biographies. She currently lives in Brixton with her (apparently) much cooler and funnier housemate.